This PowerPoint book was made with photographs of people from Microsoft Clip-art and the picture of Mr. Turkey, also from Microsoft Clip-art. Mr. Turkey has a transparent background and can be easily placed on photos. To customize this PowerPoint, substitute the Microsoft Clip-art with photos of your students and/or places in your classroom or school. Print the book, view it as a PowerPoint or import it to use on your Promethean or Smartboard. Print handouts to make mini-books or small visuals. AND, save your PowerPoint as a PDF to add it to your iBooks collection. 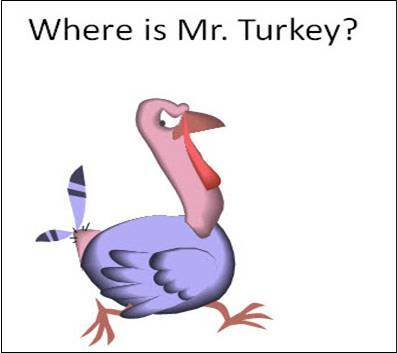 Well, I made this turkey PowerPoint activity earlier this week and was set to post it this weekend, when today, while reading blogs on my Google Reader, I saw that Richard Byrne, at Free Technology for Teachers, posted a very cute app for Thanksgiving - Mr. Turkey, Where are You? It goes along nicely with this PowerPoint giving students the opportunity to answer where questions, but also introducing some Thanksgiving vocabulary. AND, it's free!